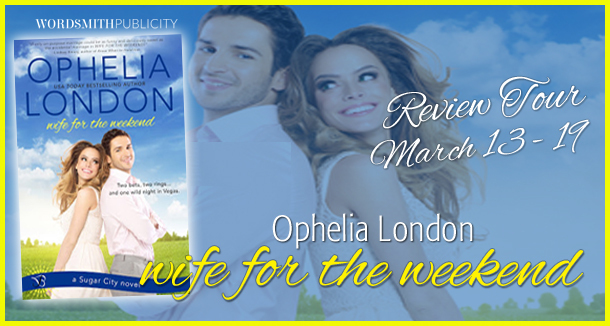 We are thrilled to celebrate the release of Wife for the Weekend by Ophelia London! Be sure to check out all the book info, fun posts, and giveaway! When bad weather closes the airport, free-spirited Jules Bloom finds herself stuck with the admittedly hot but total suit Dexter Elliott. 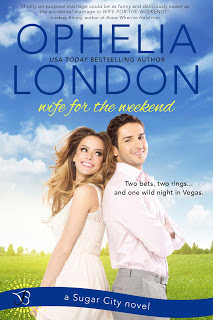 One night and one large pitcher of “Vegas Sunrise” later, Jules wakes up in a hotel bed with a vicious hangover…wearing nothing but a wedding ring. Determined not to ruin his brother's wedding, Dexter strikes a deal with the frustratingly gorgeous Jules to continue their quickie marriage through the weekend. Only she keeps getting under his skin in unexpected ways. Book 3 in the Sugar City series, can be read as a stand alone. Here's your excerpt. Thank you! What have you been telling people?” Dexter asked as soon as they were behind the rosebushes. “Can you be more specific?” Jules said. “Well, stop,” he growled, but then dipped his chin and laughed. Have you visited Sugar City? USA Today bestselling author Ophelia London was born and raised among the redwood trees in beautiful northern California. Once she was fully educated, she decided to settle in Florida, but her car broke down in Texas and she’s lived in Dallas ever since. A cupcake and treadmill aficionado (obviously those things are connected), she spends her time watching arthouse movies and impossibly trashy TV, while living vicariously through the characters she writes. Ophelia is the author of the Sugar City series, including WIFE FOR THE WEEKEND and KISSING HER CRUSH; AIMEE & THE HEARTTHROB; CHALK LINES & LIPSTICK; DEFINITELY, MAYBE IN LOVE; the Abby Road series; and the Perfect Kisses series. Visit her at ophelialondon.com. But don’t call when The Vampire Diaries (or Dawson’s Creek) is on.